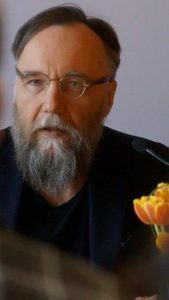 World-infamous Russian geopolitical theorist and philosopher Alexander Dugin , who has been called “the most evil man in the world today,” joins Fróði Midjord in the latest episode of Guide to Kulchur  to discuss the ongoing crisis in Ukraine. This is the first of a two-part special on the conflict between Russia and Ukraine, which is also between the East and the West, in a geopolitical sense. Topics discussed include the historical relationship between Ukraine and Russia, the motive for the Maidan protests which kicked off the crisis, the reasons behind Russia’s annexation of Crimea and its intervention the breakaway regions in eastern Ukraine, the reasons why Putin is demonized in the West’s political worldview, the concept of Eurasianism, and Ukraine’s prospects for the future. In the next episode, Fróði will talk to a Ukrainian intellectual who will explain the Ukrainian point of view on the matter.